Saturday 17th March 2018 will now go down in history as one of the greatest exhibitions of excellence that not just Ladies Handball, but that the game of Handball has ever been privy to. Where does one begin to tell the tale of the events that transpired on this now infamous night? We will start by setting the scene; after calming from the electric Boys & Girls Minor finals – the crowd waited with breath that was baited for the show down of all showdowns to commence. Though still very much in it’s infancy – the already legendary rivalry between the Cork star, Catriona Casey and the Limerick star, Martina McMahon saw a packed gallery wait in silence as the tension was palpable with desire and determination rolling off each player in waves. The battle ground awaited, primed and perfect by the members of Kingscourt HC, the referee, James Brady of the home club looked with a steely stare at the empty vessel of the alley as two titans of the game marched in. McMahon had the first serve – she took her time, gave the ball a couple of bounces to steady herself, and with a crack like that of a whip, she struck the ball off the front wall and our game was finally in motion. In the early rallies of the first game the two Ladies were neck in neck and point for point. Both players clinical and ruthless in each shot, giving an exhibition on roof shots, passing shots, you name it – these ladies can do it and then some. The game seemed that it was destined to be a close affair as at 7-7 both ladies were leaving nothing behind. 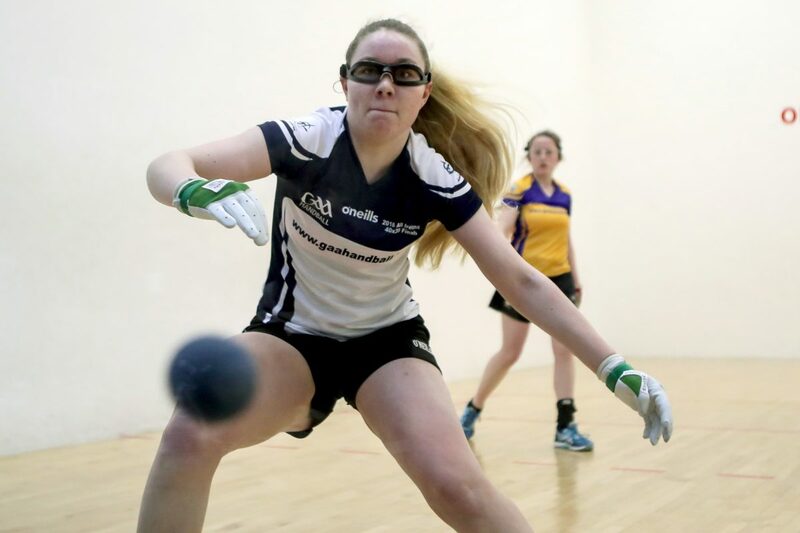 It was at 13-12 that the tide started to turn in favour of the Ballydesmond Handballer – after knocking McMahon out of service Catriona took the reins and took control of the court form there on in. Not allowing McMahon even another sniff of a score, Casey put the foot on the accelerator and closed out the first game 21-12. As the second game commenced with Casey having the opening serve – it seemed that McMahon had dropped her head and that Catriona was primed for a comprehensive victory. Mirroring the predeceasing Ladies Minor Final game before it – McMahon knocked Casey out of service at 10-2. The Broadford Lady took a time-out and seemed to smile entering the alley, almost, it seemed, accepting her defeat. However, nothing could have been further from the truth as the comeback was on – McMahon showered Casey with power serves and shots hammering the Corkonian with sheer strength. Casey is no mere contender though as her clever placing of balls and clinical accuracy kept the pair within a hair’s breadth of each other. When McMahon scored that 17th point – levelling the game again, we saw a brief and uncharacteristic celebration which enticed the crowd that she was far from finished. There were truly some eye watering rallies in this game as McMahon synched a 21-19 victory. It was here, in this third game – that the glass ceiling and perception of Ladies Handball was absolutely shattered by two of the most inspiring athletes to have ever played the game of Handball. To say it was evenly matched would be an understatement – the pair levelled an incredible 10 times during the game. With each levelling point the atmosphere turned more and more competitive and the crowed began stamping and cheering in an unprecedented manner in Irish Handball. So, there we were 20-20, All-Ireland Glory, Irish Team Captaincy, and pride at stake, everything to lose. McMahon served twice for the game for Casey to knock her out – it seemed that that was it. Miraculously, incredibly, McMahon somehow managed to out manoeuvre Casey and find herself serving for the game for a third time. The game had been going on for over two hours at this point – footwork was waning, strength was fading, concentration lapsing – it was a game of sheer will and determination at this stage. McMahon blessed herself and then served the ball, Casey returned a roof shot, it came off that back wall, and as though in slow motion McMahon took the ball of the back wall and ‘flattened it’. It was a risky shot with so much on the line, but boy did she roll it. Indeed, it was, words cannot describe the psychological strength and physical skill that was displayed by both players on this day. McMahon is a first-time All-Ireland champion, but Catriona Casey is a true champion also for the determination and resolve she demonstrated in this game. Only time will tell how the future battles between these two will pan out. One thing is for sure, the true winner is the sport of Handball. To watch the full game – check out GAA Handball’s Facebook Page and YouTube Chanel. Ladies Minors Set the Fire Alight with a Hair Raising Opening Game. 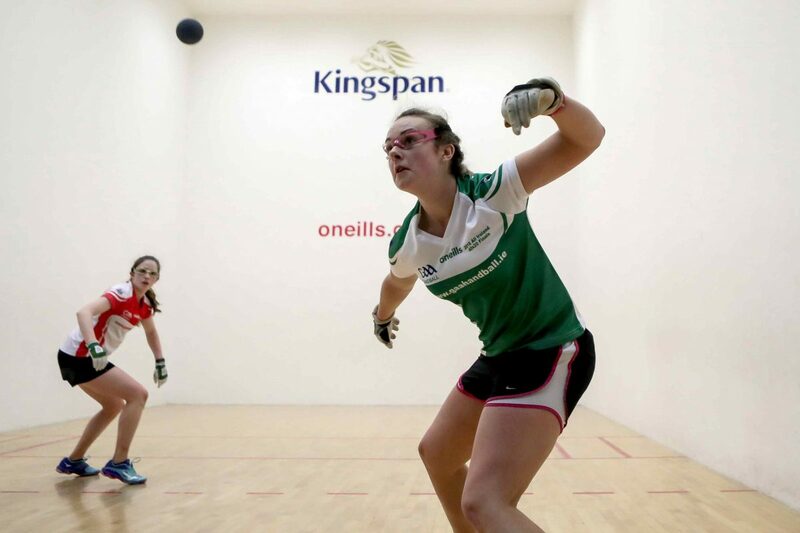 Our Ladies Handball journey began with the Ladies Minor Singles 2018 O’Neills All-Ireland Final contest between young stars, Kildare’s Leah Doyle and Clare’s Catríona Millane. In the first game, both athletes blew on to the court with sheer tenacity and strength of conviction. Their talents were evenly match in game one as they gained point for point off the other, leveling 3 times, the 3rd of which was at 12-12. From here, the Lexslip native, Leah Doyle, really found her stride and stepped it up a gear. She wowed the crowd with an array of dazzling shots and incredible retrieval skills, not allowing Millane to find a foothold in the rest of the game by finishing the first 21-12. The second game started with the Clare lady on a mission, it seemed that Doyle had no answer for the new level that Millane had found and it appeared that we might have been destined for a 3rd game. However, at a 10-1 deficit, the incredible happened. After winning her way back in to service, Doyle took a well calculated time out – a quick word with her coach and a calming breath saw the young athlete attempt a feat that even the most experienced sportsperson would find difficult. Doyle stepped up and rattled off a string of Aces with one of the best low power serves to be seen at any minor level of the small alley code. Suddenly, the game was neck in neck at 15-15, Doyle continued to put the pressure on for the remainder of the match only allowing Milane one more point for the duration of the game. She continued to blitz with her serves and took the second on a score of 21-16. I fell asleep in the second, but I came back – and that’s what counts! The difference in these two athletes was definitely Doyle’s incredible serve, when asked about how she achieves such an impressive skill, the Kildare Lady was humble in her response. 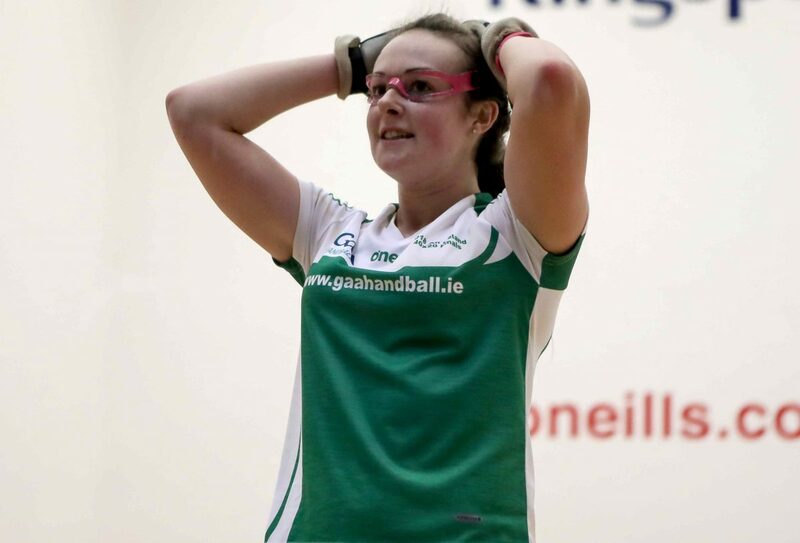 “I actually put in the least amount of work on my serve, it’s mainly only training games that I use it and when it comes to a match – I just hope that it works out on the day, and today it did.” When asked how she prepares for a big occasion such as an All-Ireland final, Doyle has a glimmer of some unknown secret in her eye and laughs as she says, “I hang around with the McCarthys”. To relive the All-Ireland final between these two ladies head over to GAA Handball’s Facebook for full coverage of the game. 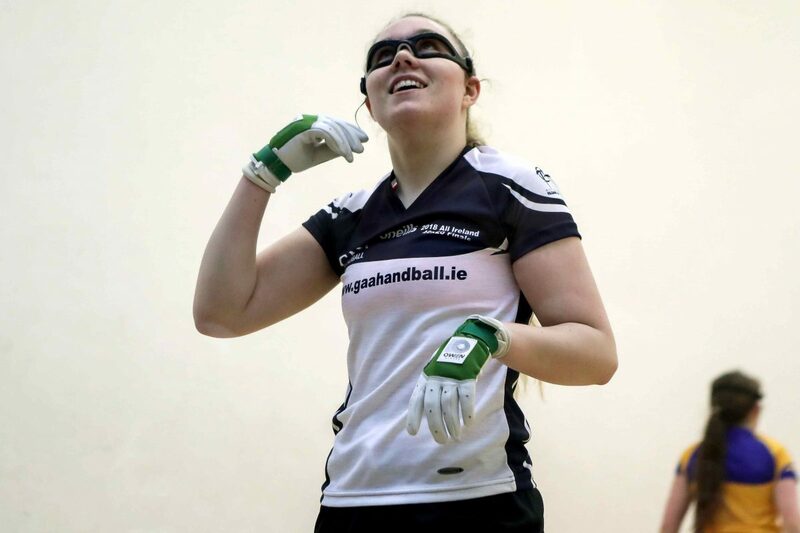 Well done to both contenders on what was an incredible game of Handball and a very fitting curtain raiser to the Ladies Senior Singles Final that took place immediately after.